Internet, phones and more for business. Coffs Harbour & Port Macquarie. Allowing your business and people to connect. At C3 Group, we’re all about security. For some companies, it’s non-negotiable that all communication carried out online, is done so privately. For these companies, we suggest implementing a Secure Private Network (SPN). This is a totally private network that connects offices in multiple locations over a wide variety of technologies, including ADSL2+, Ethernet over Copper (EoC), Ethernet over Fibre (EoF), NBN Fixed Wireless & Fibre, Mircowave and 4G. 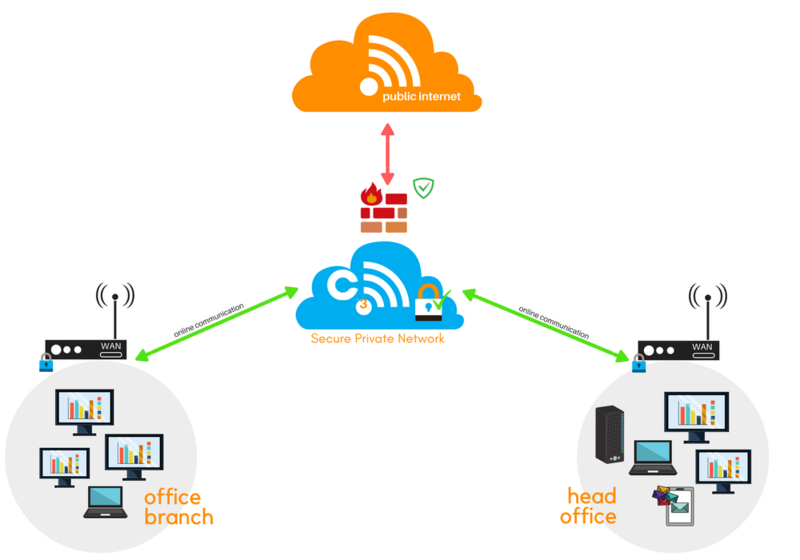 Being a direct private connection, there is no Virtual Private Network (VPN) overhead, additionally Internet is injected at a single Firewall source in our Private Cloud, promoting the highest grade of performance, privacy and security when communicating online. Interested in a Secure Private Network for your company? Contact us. Our Managed Security options are available to all companies, whether they work using on-premise solutions (i.e. physical servers in your office), or hosted solutions (cloud services). Our managed security solutions are called Firewalls. They’re solutions that sit at the edge of a network and monitor all communication that comes in and out, filtering malicious or banned content. Firewalls have customisable options to allow for a more personalised approach to security on top of the standard safety they supply. This is beneficial for business owners who wish to limit the sites their employees use within work hours. For those companies working with on premise solutions, Firewalls are a physical appliance we install in your office with your server. It’s a small, efficient device that’s ideal for SMBs, with superior customisation and reporting abilities. For those companies who work with hosted solutions, we offer virtual firewalls. These perform the same job as physical appliances, however, they’re doing their filtering job in the cloud. No matter how your company chooses to utilise technology, we always supply solutions that give you optimal safety – which is something we consider to be of the utmost importance as cybercrime continues to advance. Enquire about our Hosted & On-Premise Managed Security solutions. One point of contact for support. Learn more about our 4G Internet connections. Our business telephony solutions offer a seamless communication experience, both internally and externally. We offer physical and virtual systems that easily integrate with computers and mobile devices to boost productivity wherever you are. Management of your phone system has never been so easy! Ongoing maintenance is reduced to almost nothing, with automation of everyday tasks and the ability to monitor critical processes from a single dashboard. We have integrated the most advanced and up-to-date security protocols and technologies into C3 BusinessTelephony, safeguarding your communications against all types of attacks. It’s also easily personalisable with security features such as IP blacklisting. Softphones available for Windows & Mac, and smartphone clients for iOS & Android work seamlessly in conjunction with Web Client for unbeatable connectivity and mobility. Integration with your other applications is easy; connect C3 BusinessTelephony with popular CRMs such as Salesforce, Google Contacts, Office 365 and more. Employees can save time and increase productivity with call pop-ups, journals and more by working across Apps with ease. C3 BusinessTelephony includes a full suite of unified communications features without the need for additional downloads, add ons or purchases. You can video conference, screen share, whiteboard and more! Download our C3 BusinessTelephony brochure to learn more. We provide copper and fibre infrastructure cabling, as well as fixed wireless solutions to get you & your team connected to the internet. We base your connection on the best-fit model + your preference, giving you a solution that provides superior communication between you, your staff and your customers.